Who makes homemade Worcestershire Sauce? Then, the first recipe I stumbled upon was Emeril’s, which began, “Saute onion in olive oil….” Nope, not gonna do that. So then I added “easy” to the end of my Google query. Behold, this lovely, very simple recipe. I made it in 5 minutes, and had all of the ingredients on hand already. Smells like Worcestershire Sauce in my apartment now. 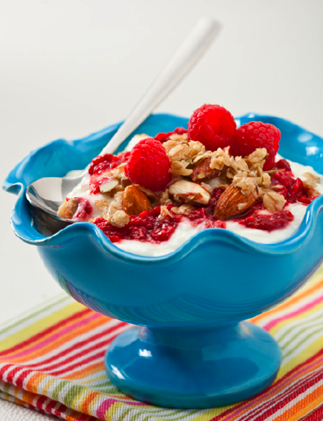 I made some granola from a recipe by Laura of Wholesome Junk Food and loved it. I gave the recipe to my sister and she loved it. She told me later that she had passed the recipe on to several other people who had tried it and loved it. I recently gave the recipe to my cousin, who is enjoying it, and now her sister wants the recipe too. Obviously time for a Smorgasbite recipe post! 1. Preheat oven to 325. Grease shallow 14 x 11 inch pan. 2. Combine dry ingredients and wet ingredients separately and then mix well. Spoon into prepared pan, firmly patting the mixture to the edges. Happy Halloween! I came across some creative and somewhat spooky Essential Artists Bottles from 1800 Tequila that would be awesome for celebrating tonight. 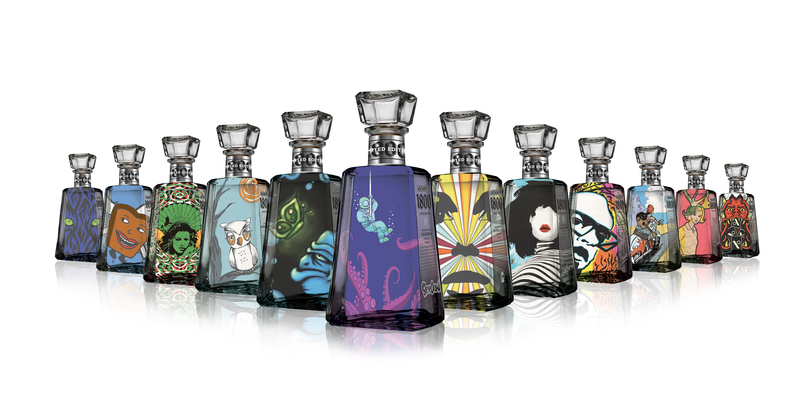 Eleven up and coming artists contributed their designs to create these limited-edition masterpieces – with one celebrity bottle designed by Shepard Fairey’s Studio Number One. The grand prize winner was Steven Wilson whose bottle is front and center in the picture. My favorite is Chad Shore’s (featuring the woman with dark hair, fifth from right). View the whole collection here. Which is your favorite? 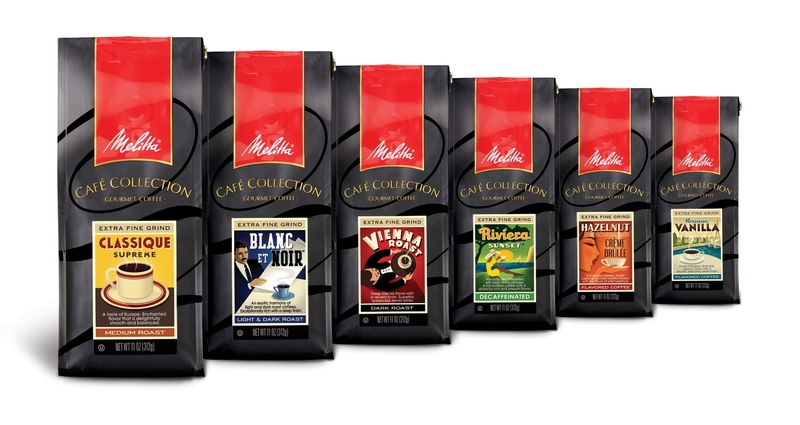 Melitta Café Collection: Ready Set Joe! Melitta‘s Café Collection is so beautiful, no? Thanks to Jessica we’ve been able to try the Classique Supreme and Parisian Vanilla. Both are very fine grinds with lots of flavor. The vanilla scent wafted through our whole apartment! 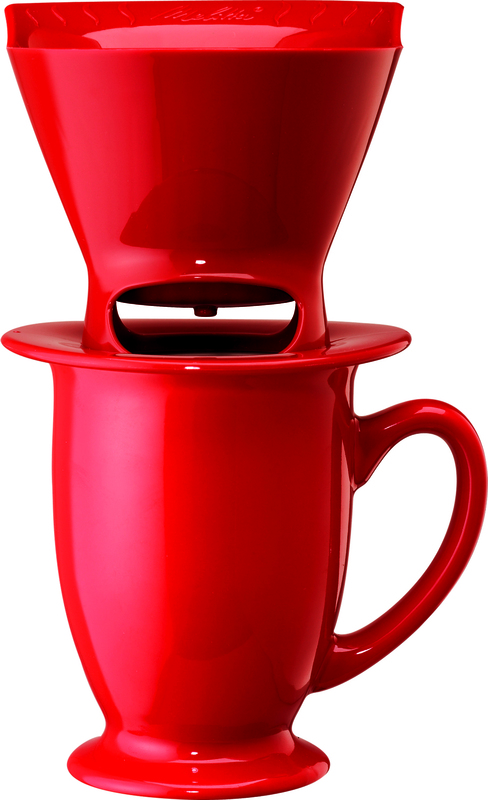 Melitta also has this cute “Ready Set Joe” personal brewing apparatus. We’ve switched to using this instead of our french press for days that we only want a small amount of coffee, or if we want to “brew” different kinds of coffee for different people. So convenient- just pour in hot water from the tea kettle and it’s ready in a minute. 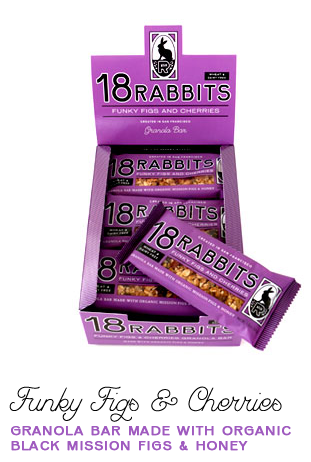 18Rabbits knows how to make delicious granola bars! From the two flavors I’ve tried (pictured), the ingredients were extremely fresh and the fillings were large plentiful, just the way I like it. And really, anyone who offers me figs wins my heart. Thanks, Kelsey, for sending these bars to me. 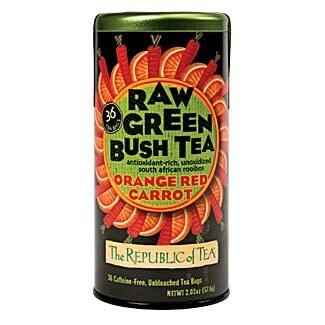 Currently loving Republic of Tea‘s new Raw Green Bush Tea– the Orange Red Carrot flavor. Check out new Pretzel Crisps by the makers of New York Style Bagel Chips and Pita chips! They’re perfect for fun appetizers. 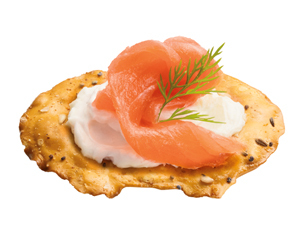 Above left is smoked salmon, cream cheese and dill atop an “Everything”-flavored pretzel crisp. 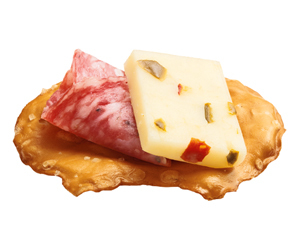 Above left is jalapeno cheddar and salami atop an Original flavor. 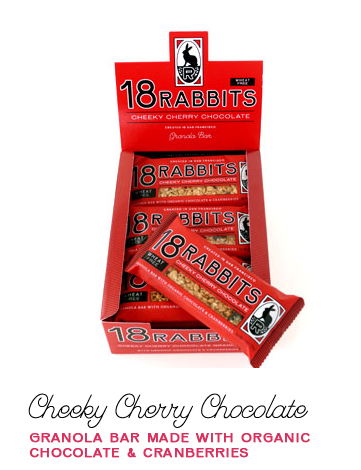 More pairing ideas on the website. I’m not a huge pretzel person, but I preferred this shape (and ease of adding other flavors) compared to regular pretzels. I served them with a cheesy sage dip at a recent dinner party and people seemed to enjoy them. Thanks to Shaina for sending some samples my way. My friend Rachel hosted a Saturday brunch a couple of weeks ago. 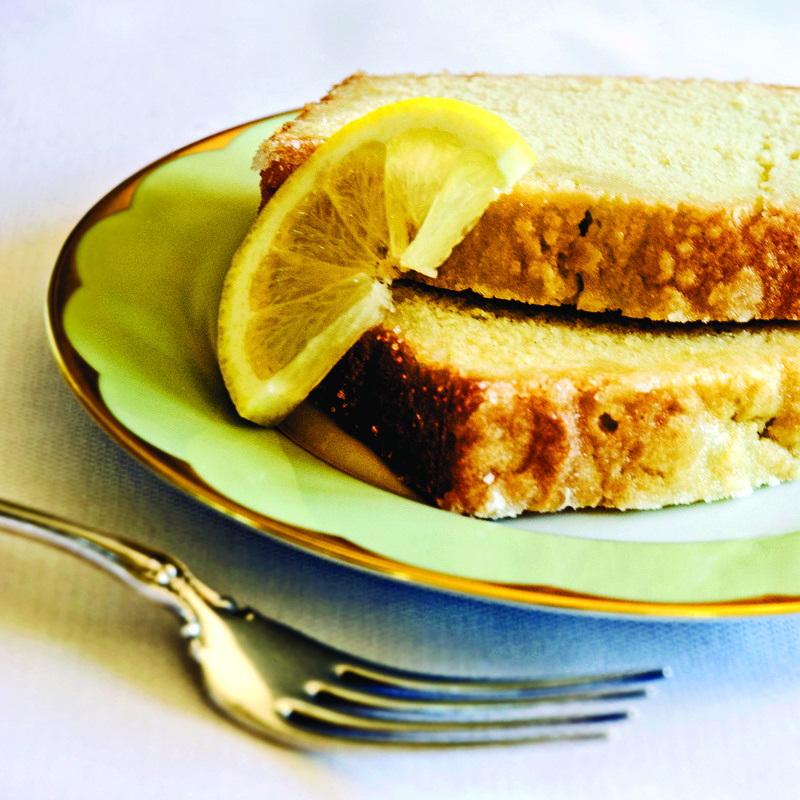 My contribution was Lemon Pound Cake from the cookbook Simply Suppers by Jennifer Chandler, a graduate of Le Cordon Bleu in Paris. Thanks to Katie for sending me this cookbook; I’ve been loving many of its recipes. 1. Preheat the oven to 325 degrees. Grease and flour a 9 x 5-inch loaf pan. about 60 to 70 minutes. While it is still in the pan, pierce several holes in the cake with a knife or skewer. Prepare the glaze and top before the cake is completely cooled or removed from the pan. 4. To make the glaze: In a small bowl combine the melted butter, sugar, lemon juice, and water. Stir until the sugar has dissolved, about 1 to 2 minutes. Pour the glaze over the cake and let the cake sit in the pan until the glaze is fully absorbed, about 20 minutes. 5. Remove from the pan and transfer to a serving plate. Serve at room temperature. Where to Buy Bovril in NYC? 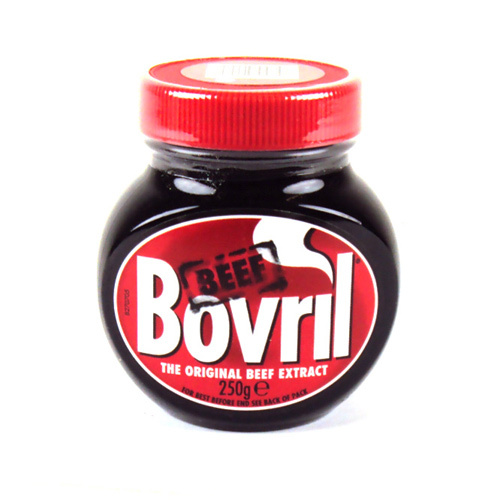 Who knows where Bovril is for sale in NYC? Tea & Sympathy perhaps? Does anyone know? My grandparents-in-law use it in beef stew but it hasn’t been easy to find lately. I’m a fan of whole grain pastas. The indulgence and comfort of warm pasta, with extra nutrition? Works for me. 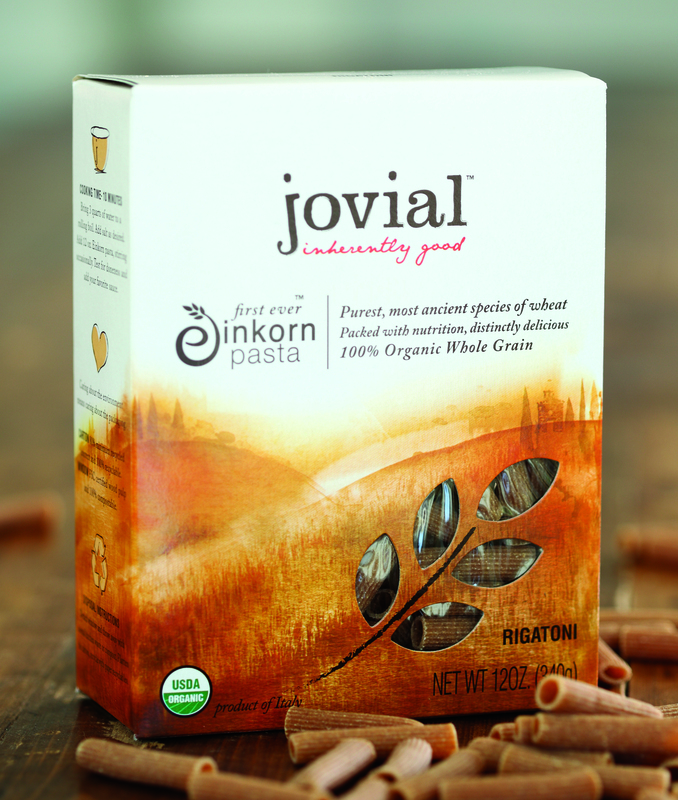 I was happy to test out some new Einkorn Pasta by Jovial, thanks to Lisa. And how about the taste? Hearty and flavorful, in my opinion. That said, someone who loves “regular” white pasta may not appreciate the difference. But anyone who already enjoys whole grain pasta might want to check this out!